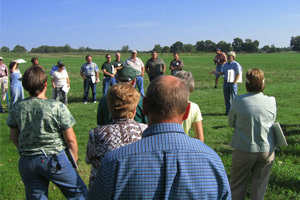 Self-guided: a Sustainable Agriculture Walking Tour of our research is available May 1 through November 1, free of charge. This ¾-mile walking tour takes about an hour to complete. Visitors can enjoy nature while learning how scientists at KBS are researching ways to help make farming profitable while protecting and enhancing our state’s natural resources. Trail guides are available at the trail head and lead visitors through 16 stations. The self-guided trail is open dawn to dusk. No pets allowed. 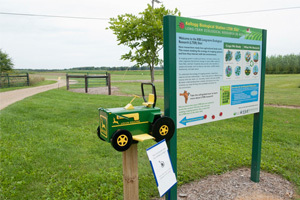 Trail head and parking at the LTER Field Lab at 10378 40th Street (across from the KBS Dairy), Hickory Corners, MI 49060. K-12 students: We have developed an on-site science activity for elementary students (grades 2 through 5) based on KBS LTER research. With guidance from a trained KBS volunteer, an interactive activity booklet leads students through a 1-mile nature trail at the W.K. 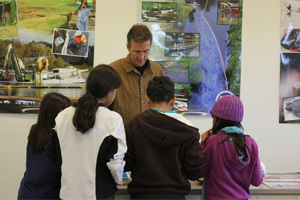 Kellogg Bird Sanctuary, teaching them about agriculture, ecology, and the scientific method. Each of the 15 lessons meets Michigan’s teaching standards. Based on teacher input, we created an accompanying teacher’s guide with background information and additional activities for the classroom. The trail is open April 15 through November 1. To use the trail, classes MUST be accompanied by a trained KBS volunteer. To schedule a visit, teachers can contact tours@kbs.msu.edu or (269) 671-2510. Public outreach events: Every year we participate in various outreach events around Southern Michigan and on MSU’s main campus. Connect with us via our social media to stay updated on these events. While visiting our research, make sure to check out other tour opportunities at the Kellogg Biological Station, including the Bird Sanctuary, Pasture Dairy Center, and Kellogg Manor House.